The breathtaking views are enough to steal your heart, I will let the images do the talking. Iliovasilema means Sunset in Greek which of course is perfectly fitting for the hotel that offers the most incredible sunset views straight from your hotel room. Ilisovasilema is located between the two main hubs in Santorini Oia & Fira making this the perfect location to access both places, Our taxi journey was only 5-10 minutes to Oia so it really is a very convenient place to stay. On arrival we were greeted by a lovely gentlemen Paris who made sure we were looked after at all times throughout our stay, The staff at Iliovasilema where amazing, friendly, kind, helpful & willing to go out there way to make sure you enjoyed every moment of your stay. Like many if not all hotels in Santorini it was situated within the cliff and hosts a varied range of rooms all with their own unique designs and layouts. From cosy rooms to lavish suites they have a great variety to offer depending on your budget & requirements. Each room came with a complimentary bottle of wine & some essential amenities such as air-conditioning a kettle & your standard towels ect.. Some rooms even had their very own pool that looked out into the sea, a certain wow factor and huge appeal the hotel offers. A reoccurring patten in Santorini and even more so here was the cleanliness of the place it was immaculate, I myself am a bit of a clean freak so for me I was in heaven. The overall stay at iliovasilema suites was fantastic & the views will stay with me forever. I would put this on your bucket list guys it is a must visit spot in Santorini. The Notos Therme Spa offered a different side to Santorini, beach side the hotel looks out over the fishermen’s port & marina, just silence & calm seas greeted us on arrival. 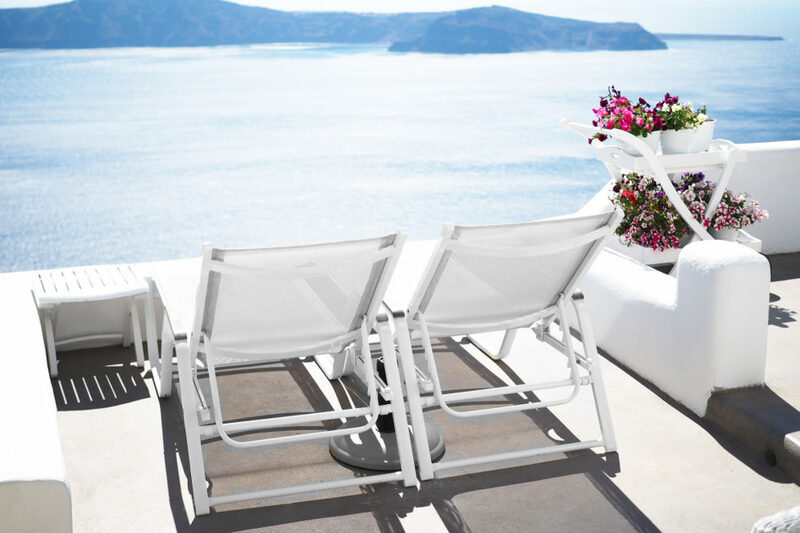 The unique location of the hotel means you get to experience the Vlychada beach with its white volcanic formation & black sand the stunning sunset views will leave you mesmerised. For many of us a holiday is an escape, the perfect opportunity to unwind, destress & reenergise ready for everyday life. Here at Notos they supply the perfect package for a complete detox. With a fully operating spa which hosts a natural spring water pool, sunrise Yoga, delicious healthy food, two pools with sun loungers and a roof top cocktail bar for evening entertainment, all located in a quite relaxing location, where can you go wrong. On arrival we were greeted with a glass of local wine & a tour of the hotel, The staff were great and always tried to accommodate where they could. The food at Notos was just insane. It didn’t matter what you ordered you knew it was going to be mouth watering. The Notos Therme spa is perfect for those who are looking for treasurable moments, pure relaxation all set in one of the islands most scenic locations. If you want to Discover Greece I have linked both the Hotels below for more information. I would highly recommend flying with Aegean air who took us from London to Santorini safe and sound. Shop The featured clothes by clicking the images below. Absolutely loving the photography! Greece is stunning.